My daughter is currently obsessed with her belly button. She calls it her “bah bah”. She’s also obsessed with books, and she also calls them bah bahs, so it can be a bit confusing at times, but we figure it out. Anyway, she spends a good chunk of time with at least one finger touching her belly button. She reaches for it when she needs a bit of comfort, and she’s quick to show off her belly if you ask her where her belly button is. Because of this obsession, we’d stopped putting onesies on her. It was just so sad to see her searching for her belly button and only coming up with fabric. The onesies she’d been given (we never say no to hand-me-downs!) were just sitting in her drawers, while her few t-shirts were on a heavy wash-wear-repeat cycle. It finally dawned on me that I could pretty easily convert all of those lonely onesies into belly button friendly t-shirts by just cutting off the bottoms. Then I remembered that many of you commented on my post about securing serger ends to say that you often use fray blockers to finish your serger ends. I’d never used anything like it before, but I figured it was worth a try, so off I went to pick up some of my very own. I chose the June Taylor Fray Block because of this Stitcher’s Guild Forum (thanks Debbie of Stitches and Seams!). The forum had warned me it would be runny, but what I hadn’t expected to find was that I was supposed to hold it under hot water for 3 minutes and then shake it for 30 seconds before use. Is that typical for these types of products?! I can’t seem to find any information on what it’s made out of online. The only thing the tube says is that it’s flammable, so my guess is that it’s some sort of magic anti-fraying compound dissolved in a flammable solvent. The heat and shaking could then be to make sure the magic compound is appropriately mixed with the solvent before use? 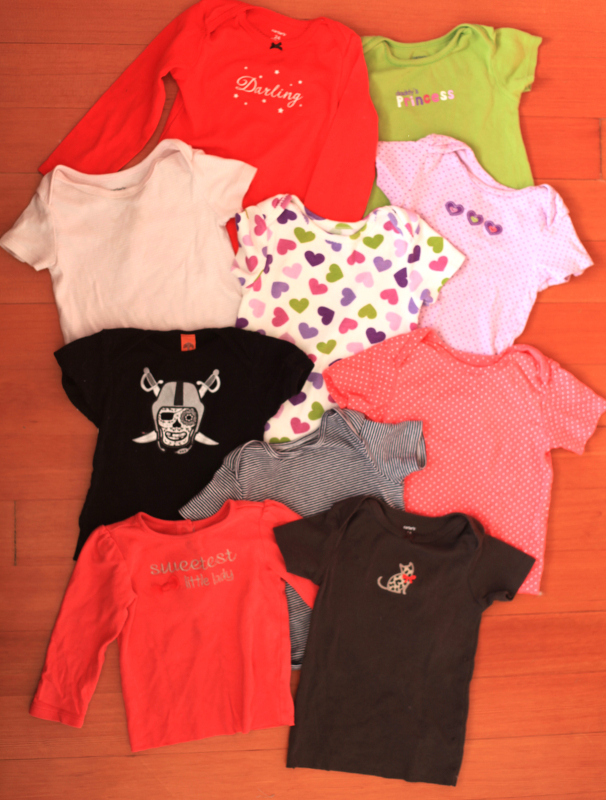 Anyway, long story short – my darling daughter now has ten more t-shirts to add to her rotation, which has slowed the wash-wear-repeat cycle tremendously! The Fray Block has held up to her running and playing, and I’ve actually already used it again on my most recent projects. Stay tuned for those! Previous Post SA Curve Ruler Discount! You are a great mom! Good idea to cut the onesies off. Thanks! She’s been very happy with her new set of shirts! Great idea and now your daughter has a new wardrobe! I recently purchased the same fray blocker and was surprised by the instructions. I’ll be watching to see if anyone has more info. No kidding, this has been a to-do for me for ages. Ollie’s getting longer and the onesies don’t fit anymore. This post was a good reminder that it can and should be done! Nice to give clothes some more life! Do it! It took me all of five seconds. One swipe of the rotary cutter, two dots of Fray Block. Done! I’ll have to get some Fray Block. Can’t beat easy! Yes, you gotta love the cat! I did this when my daughter was coming out of Indies. Never heard of fray stop! Great idea, I will investigate. Glad I’m not the only one who chops onesies! She is absolutely adorable! And the little shoulders of the top you photographed her in are really beautiful. Thanks! And, those shoulders are typical onesie shoulders. They stretch to allow a baby’s giant head through! This is the cutest thing I’ve read in a long time, even before I saw the picture! So sweet of you to cut down the onesies, the t shirts look great. Need to check out this fray stop stuff! So far it’s done wonders to keep the seam from splitting. I’m very happy with it so far, but I should probably report back in another couple of months! She’s so adorable! And that was such a great idea to still get use out of the onesies. Thanks! I think she’s pretty adorable, too. I had to use this photo for the post because it made me laugh to see her strike a pose! Hahaha! Hope all is well with you and your family! Oh my gosh, how cute is that! Obsessed with her belly button, awww!!! Love this idea of recycling the onesies and getting heaps more wear out of them. Well done! I love June Taylor’s fray block! Thing I don’t love so much is that the ‘mouth’ of the tube just broke off. Now the entire tube (still pretty full) seems unusable. I should do some refashion too! Width wise she still fits in 3 month onesies, length wise,not really 😉 (going on 8 months old). She is so adorable! And what a good idea, to cut off the onesies! We had the sad moment this morning when DS (The Younger) couldn’t un-tuck his shirt to finger his belly button….. so cosmic that I stumbled upon your blog today. My daughter use to do the same thing with her belly button. Especially if she was tired and needed a sleep. I use to buy clothing, so she could reach her belly button. She is 27 years old now, and loves hers clothes.